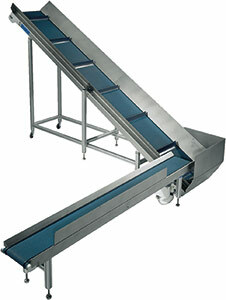 Each conveyor is driven by a heavy-duty 3-phase motor which is virtually silent in operation. Where space is at a premium, two conveyors can be linked at right angles to remove the waste – either to the left or to the right – allowing the waste container to stand adjacent to the machine in question. Busch waste conveyors are supplied to Heidelberg and Muller Martini for use with their respective models of saddle stitcher. A detailed footprint drawing of each model can be sent on request.